Weddings can be a blast, but the cleanup can be daunting. If you spent your wedding outside, or you had a long gown, there is a good chance you will need to remove stains from it. There are methods to clean any stains out of your satin wedding dress. An oxygen-based cleaner is effective for cleaning such fabrics as polyester satin and other natural fabrics. With a spoon or straw, mix one scoop of cleaning powder with enough warm water to fill a medium-sized spray bottle. Spray the stains and allow the cleaner to sit for the time specified on the cleaner box. Gently rinse the spots with clean warm water. Allow the dress to hang dry. Dryel is a a stain remover for delicate clothing. This cleaner comes complete with everything you need to clean the stains. Apply some of the solution to the spots and rub it in with the pads included in the kit. The pads are designed to absorb the stain. It is difficult to predict how your dress will react to any cleaner. By going to a professional dry cleaner, you ensure you don't make the stains worse or cause irreversible damage to your gown. Dry cleaners have professional tools and solutions to remove stains from dresses. While at the wedding there are things you can do to help fight stains. Moisten a cloth or white napkins with club soda or clean water. Dab the stain with the napkin, switching to clean parts of the napkin, until a majority of the stain is removed. There are many companies that offer the preservation of wedding gowns. Preserving a wedding gown involves cleaning the dress and packaging it for long-term storage. It also prevents the dress from yellowing over time. When a dress is preserved, stains are removed as well. Always spot-test your dress before cleaning a large area to see how the satin will react to the cleaner. Never use bleach or a stain remover that contains bleach on satin. 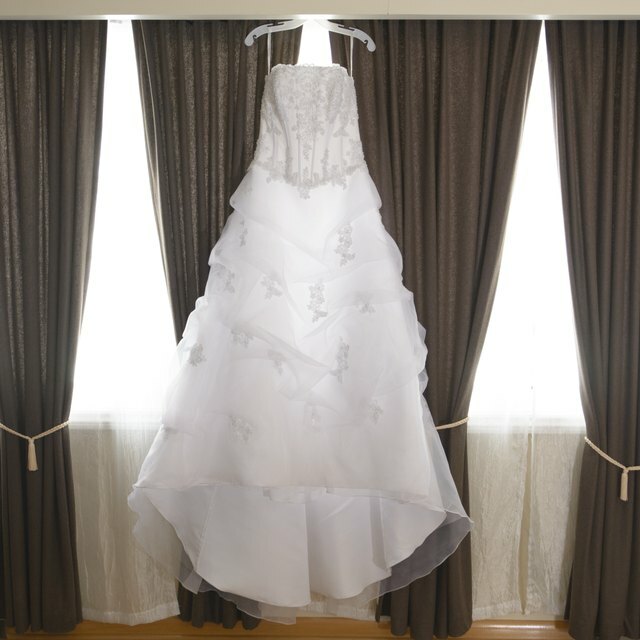 Polyester satin can be washed in a machine on the gentle cycle, but it is not recommended with a delicate wedding dress, especially one that includes lace and/or beading. How Can I Get a Stain Out of a Silk Taffeta Dress?